Julia Atanassova: You recently returned from Vienna, where you were invited to be a member of the jury of the most prestigeous austrian fashion competition, organised by Artfashion. Please, tell us in details about the event on 27 April 2002 in the capital of Austria. 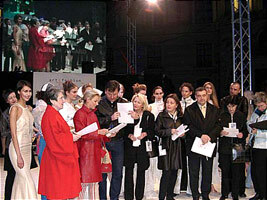 Lubomir Stoykov : I was invited by Mr. Iliver Sher, who asked me on behalf of the leaders of Artfashion (the biggest and authoritative fashion organisation in Austria) to be a member of the jury, which had to evaluate the works of the designers - participants in the "White satin" competition. This competition has a traditional character and it is on the initiative of the powerful company "Coral" - manufacturer of teh washing powder of the same name. The Coral fashion award has a considerable financial equivalent - the winner in the competition receives a money award measuring 3 500 euro. Were there any other foreign representatives in the jury except you ? Whi were its members ? Schwarz - CEO Look Models, Veronika Schwarzinger - V&V Galerie, Doz.Dr. Lubomir Stoykov - lecturer, journalist and producer from Bulgaria, Prof. Eva Willinger - "Landesinnung des Bekleidungsgewerbe Wien". I would like to emphasize that it was a great honour for me to be a member of such an authoritative jury. How did the competition itself pass ? Who were the participants for the Coral fashion award? - On the show in Vienna participated fashion houses and creators from different countries and continents, united by the fact that they live and work in Austria: our compatriot Dessislava Stoycheva - "DesignD", Anete Prehti and Sandra Taller - "Elfenkleid", "Kasai", La Hong, Linda Zlok, Nomi Goldfarb - "Nomi Vienna", Lena Kvadrat - "Artpoint", Carma Myls and Elena Grasmik - "GR Style". 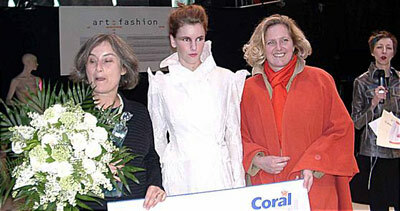 The big prize Coral fashion award on the theme "White satin" the jury gave to Nomi Goldfarb from Austria, who received also an award of 3500 euro. What is the concept of the winning dress, created by Nomi Goldfarb? - It was an ellegant long white dress. The designer herself explained to me that it is suitable for a wedding or another important occasion and it doesn't need ironing. Nomi Goldfarb uses a special technology to prepare the cotton fabric of the dress, following to main goals: the dress should be at the same time ellegant and perfunctory. How did the bulgarian participant, the young Dessy Stoycheva, present herself ? 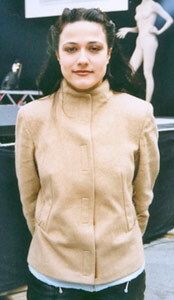 Was the conceipt of the spring-summer 2002 collection of Dessy Stoycheva similar? - No. Presenting her new mark "DesignD", she offers fresh and modern vision for the spring and summer this year. Dessi Stoycheva's collection contained 21 clothes and 4 bags made by her by hand, integrated by the common name "Brilliance of lines". The skirts, trousers, jackets, blouses and stays drew the attention with their freshness. Among the fabrics (mainly striped) dominated knitted textiles, taffeta, satin and silk. Probably the exact keyword for her construction is "asymmetry". In a personal and emotional aspect - not as a member of the jury, but as an aesthete and special delegate of Nova Television, how did you feel and perceive this event in Vienna ? 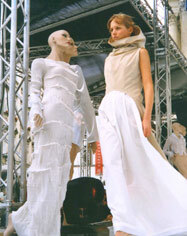 - It was a spacial thrill to watch fashion in the open air! The emotion is different, the space and the specific cultural, urban, historic surroundings add to the vision in a unique and incomparable way. Watching the fashion show under the sky, the person is fascinated not only by the beauty of the architectural landmarks, he is attracted not only by the wonders of the modern technology (sound, light, multimedia), but he is also resigned to the passion of nature!.. Such was my feeling in the heart of the capital of Austria - on "Michaelerplatz", where I was in the end of april 2002 for the holiday of Vienna. Has Vienna a future of a new world fashion center? 10. 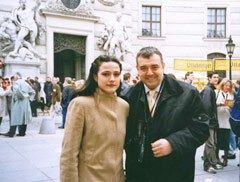 Dessy Stoycheva on "Michaelerplatz"